It’s time to look at the next Sherlock Holmes case! This is definitely one of the better ones as we see Holmes match wits against a new adversary. Interestingly enough, he knows who the culprit is right away so the main objective in the film is gathering evidence. Whether you would consider this as more of a thriller than a mystery or not will be up to you. Nonetheless, I’m always up for seeing a villain walk right up to Holmes to make threats and that ended up being pretty entertaining. 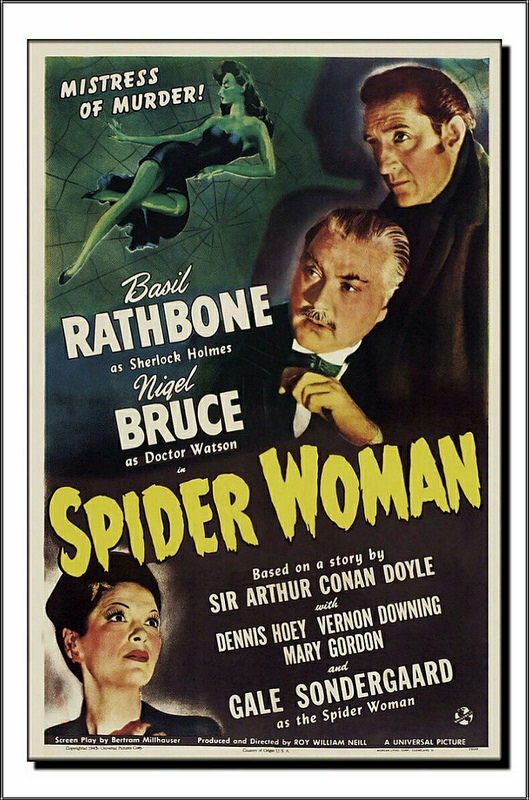 The film starts with Holmes deciding to retire from the criminal business. He has been having headaches as of late and so he won’t be of much use to the Police. Watson protests this, but then Holmes accidentally murders himself by falling into the water. Watson mourns, but then Holmes shows up and lets Watson know that it was all part of the plan. Watson isn’t thrilled about being used like this, but he has no time to pout since the Pajama murders are still going strong. Holmes figures that the best way to get in contact with the murderer is to go undercover as someone who is down on his luck. He will have to be careful not to go too far into this disguise though or it could cost him his life! The villainous Adrea makes for a fun villain with over confidence and smug personality throughout the film. Saving people from despair only to murder them after they get life insurance is certainly a clever play. She also isn’t afraid of anyone and that includes Sherlock Holmes. She sees through disguise pretty quick. It’s not even that it was a bad disguise but she is naturally wary of anyone who shows up and does what she can to prove whether the person is legit or not. What really legitimized Adrea as a big threat was when she went to Sherlock Holmes’ office to file a missing report for the guy Holmes was pretending to be. It was a nice, subtle way to threaten him while Holmes fired back. Watson doesn’t seem to pick up on any of this, but he was busy reading so I guess it is to be expected. Adrea certainly wins this round as she gets her nephew to throw a poison wrapper into the fireplace which nearly finishes off Holmes and Watson. Admittedly I was a little surprised that Holmes didn’t see this coming. After all, a villain wouldn’t just go to his base to gloat right? Well, some might I suppose but with how suspicious the kid was I was certainly expecting something to happen. This just goes to show how important it is not to litter as getting the kid to throw the wrapper in the trash would have prevented this from occurring. Even at the end she managed to outwit Holmes as she pretended to leave an opening which allows Holmes to follow her into a trap. He tries to save face by pointing out that if he didn’t take the bait she would have gotten away, but it just shows that she got him into an impossible situation. It’s only luck that allows Holmes to ultimately keep his life. Adrea was definitely the standout character here and while Holmes is still my favorite, she gives Moriarty some competition as far as the villains are concerned. Holmes is still a fun lead as always. Once again he does appear to be on the losing side when it comes to fighting another genius. Perhaps even though Holmes is the most intelligent hero he still isn’t quite as smart as the villains. Granted, villains always have the edge in these battles since they get to make a move whenever they want while the heroes end up playing catch up at first. Holmes deciding to have a sudden retirement would have hurt his character but as long as it was just a ruse then it’s okay. I doubt he could resist the allure of a good mystery for very long. Watson is a mixed bag as you would expect. He has some nice moments like when he gets some clever burns in or when he believes that a man is actually Sherlock Holmes. On the other hand, he is still a little too weak and bad at his job considering how long he has been with Holmes. Allowing the villain to knock the gun out of his hand was quite unfortunate since the heroes really had the upper hand there. I just don’t see how you can lose your gun so easily. As a minor villain I also liked the fake Spider expert. He did a good job of pretending to be the genuine article and at least he had a gun at the ready. The little slip ups that he made while talking were fairly small ones so at least it wasn’t something that you could really blame him for. He got his revenge for losing to Holmes later on as well so this wasn’t your average 2 bit criminal. The rest of the usual supporting characters like Lestrade were around as well and looked about as good as you would expect. He’s always a fun guy to have tagging along. Overall, This was definitely a fun Holmes adventure. I want to say that it’s Top 3 for sure. Once I finish the 14 films in the series perhaps I will do some kind of official rankings for all of them. Nonetheless, this is definitely a film that you will want to check if you are a Holmes fan or just like a good film with a lot of suspense. The writing is on point as always and the pacing is really good. The film is very short, but still manages to give a good amount of development to all of the characters involved. It doesn’t feel rushed which is important. It’s going to be tough for the next film to beat this one.